The audio codec market was valued at USD 5.49 Billion in 2015 and is expected to reach USD 7.44 Billion by 2022, at a CAGR of 4.3% between 2016 and 2022. The most significant factor driving the audio codec market is the increasing demand for mobile phone and tablet, which in turn, is leading to the rise in demand for audio codec market. Rising trend of consumer electronics and passenger vehicles are the other factors driving the growth audio codec market. For the study, the base year considered is 2015 and the market forecast provided is between 2016 and 2022. The audio codec market has been segmented into component, application, and geography. The audio codec market has been categorized on the basis of components into hardware and software. Audio codec components are further segmented into subtypes. The major channel types of audio codec hardware available are mono-codec, stereo codec, and multi-channel codec, while audio codec software has further been segmented based on compression type into non-compression, lossless compression, and lossy compression. On the basis of applications, the audio codec market has been segmented into desktop and laptop, mobile phone and tablet, music & media device and home theatre, television and gaming console, headphone, headset, and wearable device, automotive infotainment and others. The audio codec market has also been broadly classified on the basis of regions into Americas, Europe, Asia-Pacific, and Rest of the World. The market sizing of the audio codec market was done by top-down and bottom-up method. In bottom up approach, the number of components goes in each type of application is calculated, which is further multiplied by production of various application products for all major countries and finally the volume is multiplied by the average selling price of each components to arrive the overall market size. In top-down approach, the top companies in the market are analyzed and their product portfolio is studied to verify the global and regional market of the audio codec market arrived by the bottom up approach. The ecosystem of audio codec market includes research & development, raw material supply, assembly and manufacturing, system integration, marketing and sales, semiconductor foundry, end users, and post sales service. The report provides the competitive landscape of the key players which indicates their growth strategies in terms of the audio codec market. Study answers several questions for the stakeholders, primarily which market segments to focus in next two to five years for prioritizing the efforts and investments. 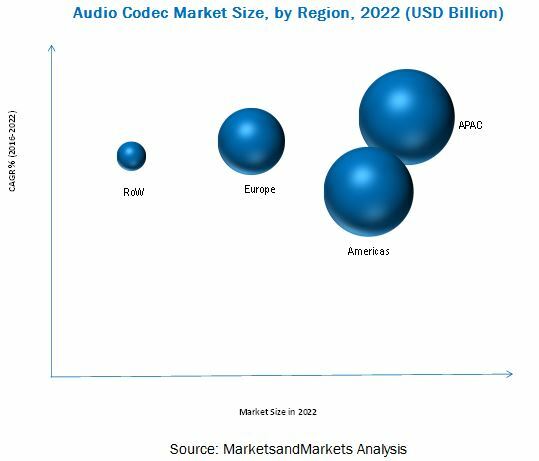 The audio codec market was valued at USD 5.49 Billion in 2015 and is expected to reach USD 7.44 Billion by 2022, at a CAGR of 4.3% between 2016 and 2022. The growth of the market is driven by the factors such as increasing Internet penetration and data traffic and growing mobile phone subscription. In almost all the regions, the consumer’s pattern is changing with the emergence of connected life in the form of connected infrastructures and machineries. Similarly, the increasing use of mobile broadband-enabled smartphones would generate an explosion of data traffic. The fastest-growing applications and the major consumer of the audio codec are wearable device, headphone and headset, and music and media device, and home theater systems. The mobile phones and tablet are significantly manufactured at a high rate among all the consumer electronics and hence consume the highest volume of the audio codec hardware IC embedded with audio codec software. Increased demand for transmitting audio with high-fidelity (Hi-Fi) with low bit rate is generating more demand for the audio codec market. The APAC region held the largest share of the total audio codec market in 2015. The APAC region has emerged as a major manufacturing hub for the consumer electronic industry; this has led to the majority of the market share, in terms of audio codec consumption volume, for both hardware as well as software. The market in this region has evolved into the largest producer of smartphones, laptops, TVs, and various other applications and, consequently the largest consumer of audio codec hardware IC-enabled with audio codec software across the globe and is expected to continue the same trend throughout the forecast period. Decline in the usage of optical media products is the factor inhibiting the growth of this market. Furthermore, for audio codec manufacturing companies, the optimization of codec IC size according to the changing consumer needs and applications is not the only challenge; but to maintain its quality and reliability along with the miniaturization is the bigger challenge to overcome in the near future. However, factors such as emerging demand for set-top box (STB) and video-on-demand services and rising demand for infotainment in passenger car can generate huge opportunities for this market in the near future. Some of the key audio codec hardware IC manufacturers include Analog Devices, Inc. (U.S.), Cirrus Logic, Inc. (U.S.), DSP Group Inc. (Israel), Maxim Integrated Products Inc. (U.S.), Qualcomm Inc. (U.S.), Realtek Semiconductor Corp. (Taiwan), STMicroelectronics N.V (Switzerland), Texas Instruments Inc. (U.S.), and DSP Group Inc. (Israel) among others. Major audio codec software providers include Dolby Laboratories, Inc. (U.S.), Fraunhofer IIS (Germany), Technicolor SA (France), and open-source software audio codec manufacturer include Xiph.Org (U.S.).